Instant Pot Split Pea Soup with Ham and Sweet Potatoes can be on the table in about 30 minutes whether you use the Instant Pot, electric pressure cooker, or stovetop pressure cooker. This recipe is dairy-free, low-glycemic, gluten-free, and South Beach Diet Phase Two; use the Diet-Type Index to find more recipes like this one. 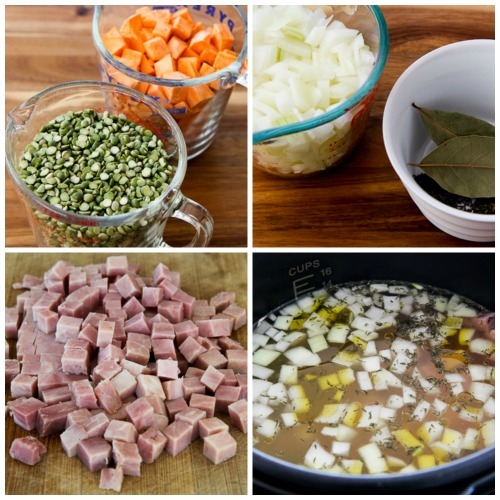 Click to PIN Instant Pot Split Pea Soup with Ham and Sweet Potatoes. There’s already a stovetop split pea soup and a slow cooker split pea soup on the blog, so I guess it’s obvious that I’m a big fan of split pea soup. So of course when I got my new Instant Pot, split pea was one of the soup recipes I really wanted to try. I also wanted a change from other split pea soups I’d made, and this Instant Pot Split Pea Soup with Ham and Sweet Potatoes was definitely a winner! If you’re looking for a low-carb soup in the Instant Pot, then this is not the soup for you. (More low-carb instant pot soups are coming soon!) But split peas and sweet potatoes are both low-glycemic ingredients, and if you wanted to make this soup lower in carbs, just use more ham and omit or reduce the amount of sweet potatoes, or replace sweet potatoes with a low-carb ingredient like red bell pepper or celery. I cooked the soup for 15 minutes on high pressure because I wanted the split peas completely dissolved and liked that the sweet potatoes were breaking apart a bit into the soup. This was really about as easy as it gets for a pressure cooker soup. Chopping up the sweet potatoes, onions, and ham takes about 5 minutes, and then the Instant Pot magically turns everything into a delicious tummy-warming soup! And this is another great recipe to add to my growing collection of Pressure Cooker Recipes on the blog! If you’re not a pressure cooker fan, you can use the instructions from Slow Cooker Split Pea Soup with Chicken Sausage and Carrots to make this soup! Peel a large sweet potato and dice into cubes about 3/4 inch square. Chop ham into pieces the same size as the sweet potatoes. Chop onions and get bay leaves and dried thyme ready, then put all the ingredients into the instant pot or pressure cooker with the chicken stock and water. Cook on HIGH pressure for 15 minutes, let the pressure release naturally for 5 minutes; then release the rest of the pressure. Stir to combine the dissolves peas with the other ingredients, season to taste with salt and fresh-ground black pepper, and serve hot. Split pea soup is not the most photogenic dish in the world, but I promise this was lick-the-bowl good! This Pressure Cooker Split Pea Soup with Ham and Sweet Potatoes can be on the table in about 30 minutes. Chop the ham into pieces about the same size as the sweet potatoes, and chop the onion into small pieces. Add the olive oil, sweet potatoes, ham, onion, split peas, bay leaves, dried thyme, chicken stock, water, and ham flavor base (if using) to the Instant Pot. Use the manual setting and select HIGH pressure and 15 minutes cooker time. Remove the lid and stir the soup the combine all the dissolved split peas with the liquid. Season to taste with salt and fresh-ground black pepper. (Taste before adding salt because you may not need any with the ham.) Serve hot. This soup freezes well and can be reheated in the microwave or in a pan on the stove. I made this recipe in the Instant Pot, but you can definitely make it in a Cuisinart Electric Pressure Cooker or a stovetop pressure cooker if that’s what you have. If you want to make this split pea soup in the slow cooker or on the stove, just follow the instructions in one of my earlier split pea soup recipes with these ingredients. You might need to add a bit more liquid for stove-top cooking. 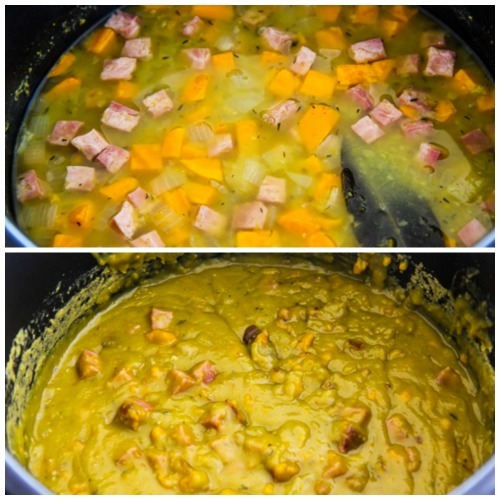 This Instant Pot Split Pea Soup with Ham and Sweet Potatoes uses low-glycemic split peas and sweet potatoes, and would be suitable for Phase 2 or 3 of the South Beach Diet. It might not be low enough in carbs for a traditional low-carb diet plan, but you can make this into a lower-carb soup by using less sweet potatoes and more ham, or by replacing sweet potatoes with a low-carb ingredient like celery or red bell pepper. If you want nutritional information for a recipe, I recommend entering the recipe into this nutrition analyzer, which will calculate it for you. This was only my second time using my Instant Pot since I just got it for Christmas. This was a delicious success! The directions were easy to follow and it came out perfect. I used the sweet potato and also added in a chopped carrot. When I first opened the pot after cooling down naturally it looked very watery but once I stirred it it all blended together beautifully. Thank you for a great recipe! My instant pot manual said you should not cook split peas in the instant pot as it can clog a valve – just wondering about your thoughts on that. I think the possibility of clogging is from the foam you get when things like beans and legumes are cooked under pressure. If you don't add some oil that foam can clog the pressure cooker, that's why I added a tablespoon of olive oil, it keeps down the foam. But as you can see it worked perfectly for me and if you google it you'll find many other split pea soup recipes made in the Instant Pot. Possibly the manual is referring to a whole pot full of split peas; that might cause too much foam. Used the split pea soup recipe as a guide. Used cubed butternut squash instead of sweet potato and added a little smoked paprika and garlic. Also used vegetabke stock instead of chicken. Added about 1/2 cup diced carrots. It was awesome! Love hearing how you switched it up! So glad you enjoyed.